In December 2013, Target disclosed that up to 40 million of its customers’ credit and debit cards were compromised in a security breach. During 2014 there have been several other security breaches at major retail stores. The large data breach at Home Depot Inc. triggered fraudulent transactions that rippled across financial institutions and, in some cases, drained cash from customer bank accounts. The 2014 holiday shopping season is now upon us. In late August, the U.S. Department of Homeland Security and the Secret Service issued an advisory about retail point-of-sale malware infections that have affected an estimated 1,000 businesses. 22.5 percent of consumers who received notice of a security breach, like the ones that occurred at Target and Home Depot, subsequently became victims of identity theft, according to a survey of 5,000 consumers by Javelin Strategy and Research, a California consulting firm that has studied this crime for more than 10 years. 1. Use one credit card for all holiday shopping. Check the online statement for this card regularly and watch for fraudulent purchases. Use the online account access or a mobile banking app, so you can check every day. 2. Immediately request a new credit or debit card. If you are aware of a breach don’t wait for your bank to replace the card. Initiate the call yourself. 4. Monitor your credit report regularly. Check for fraudulent new accounts. You can get three free credit reports (one from each credit bureau) from annualcreditreport.com and three more in many states that also mandate free annual reports. 5. Change your passwords regularly. Update all your financial accounts and use strong passwords. Unfortunately credit card fraud has become commonplace in the USA. Until the financial institutions introduce the more secure cards that make it all but impossible for hackers to breach security of the cards, this cybercrime is likely to be with us. 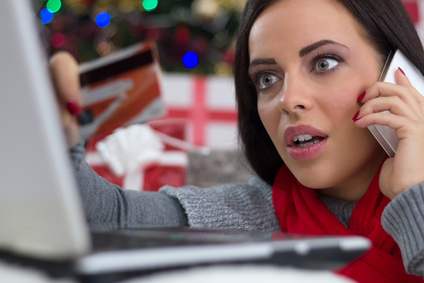 Take the necessary steps to protect yourself from credit card fraud this holiday.